Never has there been a longitudinal study of creativity of this magnitude. This book describes the original sample of students from two Minneapolis schools in 1958 and the longitudinal study envisioned by Dr. E. Paul Torrance, then director of the Bureau of Educational Research at the University of Minnesota. It explains two follow-up periods with the students in 1980 and 1998, with the view of measuring their adult creative achievements. The author in collaboration with Dr. Torrance has selected a sample of ten individuals, for case studies who serve to illustrate the predictive validity of the Torrance Tests of Creative Thinking and the factors that support and sustain creativity as individuals mature. 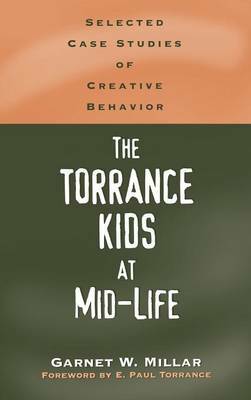 The case studies describe the individuals' school years, the first and second follow-up periods and an in-depth interview covering topics such as early influences on creativity, career paths and transitions, creative accomplishments, validation of the Manifesto for Children, and reflections on creativity. The study will be of great interest to psychologists, college and university teachers, counselors, educators and parents. Themes are derived from an examination of the case studies, and key messages for creative living are proposed.